During the days of the first time home buyer tax credit FHA lending was leading the pack in getting first time buyers into their homes. While the amount of FHA loans being issued has fallen from the peak over a third of the home sales in the Charlotte MSA have been FHA in 2011. This peaked last year at just fewer than 50%. The government's recent changes to qualifying standards for FHA mortgages, along with lenders' own requirements for these loans, are likely contributors to the gradual decline in the number and portion of buyers using the loans. Meanwhile, the use of another type of government-insured home purchase mortgage has increased slightly from a year ago in the combined 20-market area. VA loans (Department of Veterans Affairs) represented 6.4 percent of all home purchase loans made in February, virtually unchanged from 6.5 percent in January and up from 5.5 percent a year earlier. In recent years the peak for VA loans, which do not require a down payment if certain conditions are met, was 6.7 percent in December 2010. I thought it would be worth a quick review on the FHA loan limits in the Different NC Counties and MSAs. Please Note: for Lancaster County SC ($271,050 ect...) the lower FHA limits apply. For York County you can use the Mecklenburg County Limit as it is considered part of the Charlotte, NC MSA. Have a Fantastic Week and Remember We Are Here For You. In line with the new government restrictions on rate quotes** we will be providing a link to http://www.mortgagenewsdaily.com/mortgage_rates/ and their rate guide. House Charlotte The property must qualify by location, the home price is limited to $147K and the borrowers' income must not exceed 80% of the median income. Loan is FHA requires 640 score City give silent forgivable 2nd mtg forgiven in 10-years buyer cannot go negative when they sell. NC-Bond the borrower must qualify by income and limit of assets. Min credit score is 640, silent 2nd mortgage with possible recapture at the time of sale buyer cannot go negative when they sell. FHA (includes 203(k) rehab loans) will allow 96.5% Loan with 1% Up Front Mortgage Insurance premium. The monthly Mortgage Insurance (MI) rate is 1.15% (loan amount * MI rate /12) or 1.1% (at 95% LTV or lower) MI lasts at least 5-years or until value is 80% or lower. 15-YR mortgages have lower monthly MI rates. Traditional MI: the monthly MI rate will vary with your credit score (660+ FICO score) .78% for the best credit even with a 660 score you may still want to go FHA. Lender Paid Mortgage Insurance (LPMI): Available for borrowers with excellent credit (680+), a higher mortgage rate is exchanged for no monthly MI payment. The advantage is better cash flow characteristics over the first 6-8 years disadvantage; the rate is higher for the life of the loan. Single Premium MI: in this case the borrower pays the MI in a single payment. This may be a good choice for borrowers who can get seller paid closing costs. The payment amount is a percentage of the loan amount determined by your credit score (1.95% - 3%). This option may be good for someone absolutely sure they are staying in their home for more than 7-years. 80/10/10 - Many of you remember the 80% first mortgage with a 10% second mortgage as a common solution. This solution is still available for the right borrower and can make a difference in their overall cash flow. As a borrower you will need assets in reserve after closing and an excellent credit score of 720+ (some require 740+). This is also an excellent alternative for a Jumbo loan solution using a $417K first mortgage and a 2nd mortgage to bridge to 90% of the purchase price. Typically the purchase price break off for this type of loan is $650K; however, it all depends on the borrowers' down payment. The 2nd Mortgage will typically be a Home Equity Line of Credit (HELOC). The rate is prime rate + a margin, this type of loan has a variable rate base upon the prime rate and paymnet is usually based upon interest only rates. Another loan that is an option for the right borrower is a 30-year amortized five year balloon note (must be paid back or refinanced in five years). Imagination is the only limitation. The outline above gives the base programs to consider. How they are used to create the best solution is often up to the borrower's goals and time lines. Please know we are here to help people with solutions to meet their needs. We also keep up with all the loan program changes as they happen so you don't have to. I just saw this on the New American web site and thought it was a great article so instead of mortgage news I thought I'd pass this along today. Don't worry if you have a mortgage question we are happy to get that answered for you as well, just drop us a line. Hope you have a great week. TC and DV. Did you know that there is a psychology of colors in advertising and marketing? Well, there is! Today I bought a magazine at Target called Consumer Reports. There's an article in there called "If that box could talk..." It got me thinking... I teach our loan officers and real estate partners how to market their business online every single day. However, I've never coached them on the importance of colors and I should be. I'm sure I'll be making a new presentation all about colors here shortly. I thought I would write a quick post really fast to explain the importance of colors when marketing to consumers. How many times have you made a flyer etc. without thinking about how the colors on your marketing material would affect the consumer's decision about whether or not to purchase your product? Colors play a huge roll in the advertising and marketing realm. The colors that you see on marketing materials, packages, and products are not by accident. I learned the importance of colors in all my marketing classes in college, as most marketers have. However, if you didn't major in marketing and business management like I did you probably have never thought about it. At New American Mortgage every single marketing material that is sent out has been analyzed on how the consumer will take the information with the selected color that we've implemented in our marketing material. Here are some helpful color tips that will help you decide what colors to put on your marketing materials in the future. The fed is actually asking for our input on new mortgage disclosure forms; however, you have to act quickly the time to comment expires on May 27th. In January 2010 new GFE and Truth-In-Lending forms entered into the loan process along with other confusing disclosures? Well, a new federal consumer watchdog agency wants to know what you think of a new, stripped-down mortgage disclosure form that's supposed to clearly reveal the thing you must know before you take out a home loan: ie: Can I afford this mortgage? Act quickly you need to vote before May 27th. "The current forms can be complicated and difficult for consumers to use. They're also redundant and can be costly for lenders to fill out," says Elizabeth Warren, assistant to the president and special adviser to the secretary of the treasury on the Consumer Financial Protection Bureau. The new form does address one of the biggest problems with the new GFE and Truth-in-lending statement; it tells you how many dollars you are estimated to need to close. The GFE prior to January 2010 had all the costs, payment and dollars to close on one page. The current GFE which is 4-pages doesn't let you know how much to bring to closing at all and has very clumsy wording and phrasing, when I first saw the form I had to read it three times for everything to sink in. The new form is down to two pages and does have a much easier to follow format and actually includes the important estimated funds to close figure. So you've got until Friday, May 27 to check out the forms and tell Warren what you think at an interactive website called Know Before You Owe. After the consumer comment period, the CFPB will do five rounds of testing, review, and revision with consumers and lenders in six cities: Albuquerque, N.M.; Baltimore; Birmingham, Ala.; Chicago; Los Angeles; and Springfield, Mass., through September 2011 to select and refine a single draft disclosure. So the bottom line is that we are still going to see more changes in the mortgage world know that we are here for you and your clients' to guide you through and help it all make sense. I read this article over the weekend and with all the recent natural disasters striking across the country it is a good time for everyone to do a quick check-up on their personal inventory. The author addresses a great way to document all your personal items; there is never a bad to time plan. Let's hope none of us every need it. On the morning of Nov. 24, 2007, Brad Stanley and his wife Anita watched as their home in Malibu, Calif., burned to the ground. They were not alone. More than 50 other homes were destroyed in the wildfire. With everything they owned now gone, the family had to start to process of documenting their losses to file for an insurance claim. "I was under the impression that I had insurance and they would just cut me a check," he recalls. Not so fast. Even for homeowners with good insurance policies, a claim is only as strong as the inventory list. The Stanleys realized that their own records simply were not accurate enough to cover the true cost of what they had lost. Filing an insurance claim after a disaster hits your home requires a very detailed list of all your belongings. This includes not only big-ticket receipts, but smaller things that are often overlooked, such as cutlery in the kitchen, bedsheets or the clothes in your dresser. All these items add up in the thousands of dollars as part of what your insurance claim will pay. With thousands of homes devastated this spring by natural disaster, the importance of record-keeping has never been more important. 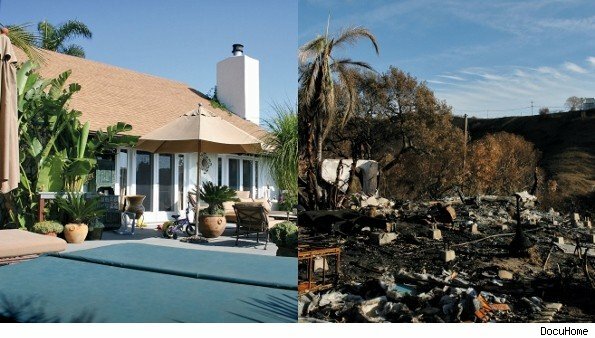 As Stanley struggled get a complete picture of what had been in his home (shown above, before and after the fire), he felt that there could be an easier, faster and more thorough way to inventory household belongings. Existing online tools, it turned out, weren't much more than glorified spreadsheets. Drawing on his background in Web programming, Stanley created DocuHome.com, which allows home owners to upload room photos, and tag furniture and other belongings much like tagging friends on Facebook. The tags are then collected into an inventory spreadsheet, where homeowners can enter values or any other notes about the item. This information is stored on remote servers, which have the same security that banks use for online transactions, and can be accessed from anywhere. After the flood or the fire, homeowners can rest assured that the inventory list remains safe. A basic pen-and-paper list stored in a safe deposit box can suffice as an inventory, but home purchases often happen more frequently than updates to the list. Digital records or software are another method but, they also require more administrative oversight than homeowners realistically devote to the task. There also is the added risk that the home disaster destroys the computer where the records are stored. 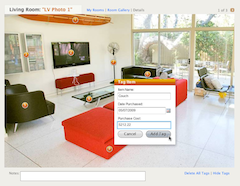 DocuHome is the first and only visual inventory system that incorporates tagged photos and stores all the information online. Stanley says that in the process of creating an inventory, homeowners might discover that they need more insurance than they are currently holding. He says that one of the hard-learned lessons from his experience was that his Malibu home was "heavily underinsured." "There is really no way to be properly insured until you know the contents of your home," Stanley says.